The Goodwood Festival of Speed may focus on cars and bikes, but it also sees a decent spread of air displays. 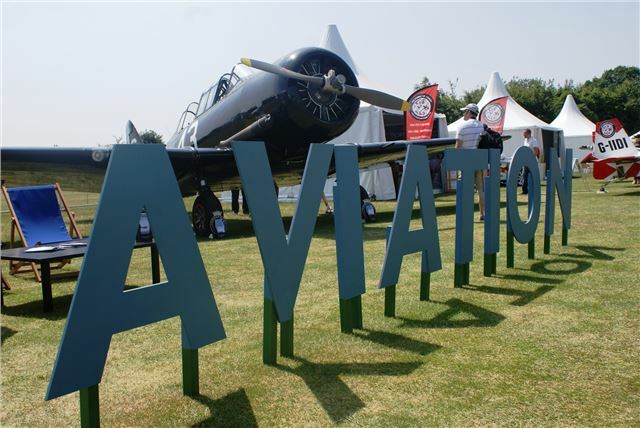 This year also saw an 'Aviation Village', with many static aircraft exhibits. There were also helicoptor flights and dynamic air displays from the likes of the Red Arrows and the spectacular Vulcan bomber. Goodwood has a permanent airfield and flying club, and can offer flying lessons to budding pilots in a fleet of Cessna light aircraft. Goodwood has an Aeroclub with numerous benefits to members, including the opportunity to fly in historic aircraft including a T-6 Harvard training aircraft. This 'Harvard' belongs to Goodwood Aeroclub. The Harvard had its first flight in 1935 and was initially designed as a trainer, although it saw combat service with numerous air forces until well after WWII. It was produced in huge numbers and there were dozens of variants. In the United States the T-6 was called the 'Texan' - but British T-6s were called 'Harvard.' It's possible to book a passenger flight in this very aircraft, with prices from £325.